There is always a beginning, but its source is often tenuous. Perhaps a chance encounter, meeting or experience sows the seed that will evolve, influence and impact society for better or for worse. In Eunice Kennedy Shriver we celebrate one who has influenced and advanced the world of those born with intellectual disabilities. She was born in Brookline, Massachusetts on July 10th 1921, the fifth child of nine born to Joseph P. and Rose Fitzgerald Kennedy. That was her beginning, but it goes even further back to the dark days of the Irish potato famine (1845-1852) when her ancestors were driven from their homeland in Wexford and emigrated to America. Had this not happened I would not now be writing this tribute on behalf of Special Olympics Gibraltar. This is the smallest country in Special Olympics, yet one of the Pillars of Hercules, spanning an area of 2.25 sq. miles, reaching a highest peak of 426 meters. Here, the lives of our people with learning disabilities have been touched and transformed by the vision of this woman of whom her mother has said, “I have known few people in the world to match her initiative, her energy and her drive”. This was quite an accolade considering the Kennedy’s were a bright and fiercely competitive family in all things. Her son, Timothy Shriver, (Chairman and CEO Special Olympics) has said, “Her faith in the athletes of Special Olympics was unfailing, even from the start”. Here we have it, the start, but where was it, that beginning? Was it Camp Shriver which she established in 1963 in her own backyard which progressed to the holding of the first Special Olympic Games in Chicago in 1968? This took a special kind of courage and belief when more participants than spectators turned up, but she was not deterred; only encouraged. That day she wore her own badge of courage as it was less than two months since her brother Bobby had been assassinated. She must have been traumatised at this senseless slaying of a second brother in a span of five years. She was certainly “brave in the attempt” as she exhorted her athletes in their new oath. Was the beginning closer to home and her sister Rosemary “and others like her, retarded in mind, but blessed in spirit”. Times to Remember. Rose Fitzgerald Kennedy. Published 1974. Her mother speaks poignantly, describing it as “not an easy matter, she (Rosemary) was born a retarded child. She was a very pretty baby and it was only slowly, as she grew to be a toddler and beyond that I began to realise she might be handicapped”. This was the early 1920’s when it was discovered she had a low I.Q. Her parents, finding the tests new and imperfect and the experts not very helpful refused to put her in a home deciding to keep her at home with the family where “we steeled ourselves at best we could and did not indicate either within the family or outside that there was anything extraordinary about her”. This was a dark era when retardation was considered a disgrace to the family, the only help having ‘them’ locked up in institutions which did not know how to care for people as human beings. (It is only in recent years that the words retard and handicapped have evolved into ‘people with intellectual disabilities’ a more enlightened term, though it must be said, that Special Olympics is currently running a campaign to eliminate the ‘R’ word, (retard) as unacceptable and still in use in vocabulary today). Rosemary, through her own efforts and the loving support of her family lived a satisfactory life until her death, aged 86 years in 2005. Her mother recounts that “Eunice, though several years younger……….was particularly good and helpful and attentive with her, encouraging her to do her best……and later on she (Eunice) became a lay expert in the field of mental retardation”. She became the Director of the Joseph P. Kennedy Jnr. Foundation for the benefit of persons with intellectual disabilities, and so very much more. She was energetic in helping war veterans adjust to civilian life, often these forgotten heroes were treated coldly and uncaringly. From the compassion and empathy she had shown her sister was born the inspiration to act on behalf of those countless others who were struggling, hampered by lack of opportunities in a bigoted world where it was considered a social stigma to have a disability. She had hope and vision and unflagging faith in the courage and untapped potential of this “forgotten population”. Above all it was hope, which can be a passive wish or an active plan or idea which needs personal action to execute it which drove her. In her son’s words, “Hope allowed her to see the invisible, fight for the isolated and achieve the impossible”. Denis Lafferty, Group Managing Director Saccone and Speed Gibraltar;” A very special lady who made dreams come true for millions of Special Olympic athletes, including our own. She spoke with passion, determination and a heart full of love”, as she became a tireless campaigner and public advocate for people with intellectual disabilities. She had the Kennedy name, considered the Royal Family of America and it opened doors for her as she garnered the famous and rallied them to her cause. She could not do it alone and built up an army of volunteers, coaches, donors, friends and fans who have become the bedrock of the Movement today. This Movement which is Special Olympics, an international organisation which changes lives by encouraging and empowering people with intellectual disabilities, promoting acceptance for all, and fostering communities of respect and understanding worldwide. It operates in more than 180 countries, and hosts 30,000 events annually for over 3 million athletes. Nearly 25 years ago the movement began in Gibraltar in what was considered a bold move for those times but took root and grew upon this little Rock of ours. Annie Risso, Programme Chief Executive of Special Olympics Gibraltar who over the years has seen the athletes, “respected by their parents, grown in confidence and self esteem”, went on, “My mentor was Eunice Kennedy Shriver, an exceptional woman of strength and courage; everyone she touched went away with a feeling of having drawn strength from her. Annie recorded rather poignantly, “The day she leaves us many people will mourn and Special Olympics will be at a great loss”. That day has come, she has gone to her eternal rest but that tenacity of spirit which kept her vision alive lives on. Joe Hernandez, CEO, Sports and Leisure Authority;”Her enthusiasm, strength and genuine humanity were clearly evident to all who had the honour of meeting her. The legacy she has left behind will continue to greatly improve the lives of all those who work in Special Olympics. She will not be forgotten as her memory will live on through Special Olympics”. It has not been my privilege to have met her, but I did glimpse her from afar one June day in 1963 when she accompanied her brother President Kennedy to Ireland to visit their ancestral home. All the adulation was for him, he whose star blazed life would dim forever a few months later. One who did meet with her at the 1999 Summer Games, North Carolina, USA is Gibraltar’s present Minister for the Environment, Travel and Tourism, the Hon Ernest Britto, long time friend of Special Olympics Gibraltar. 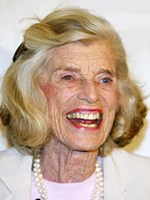 “It is with regret that I note the passing away of Eunice Kennedy Shriver, founder of the Special Olympics Movement. The impact on so many millions of persons throughout the world, either directly or indirectly the Special Olympic movement has had since its inception is immeasurable. She not only founded the Movement but dedicated so much personal time and energy to ensure its growth and success. It was my privilege to personally meet with her and her husband, Sargent Shriver and the energy they both had for Special Olympics was contagious in its intensity. It was an unforgettable experience”. Through sports, and Mrs Shriver had “a passion for football and played with my brothers”, she has helped release the potential in her “special friends”. As we mourn her passing, but look forward with the spirit of hope she kept alight, I feel sure that, though the smallest country in the Special Olympics family Gibraltar may be, our athletes are as steadfast as the mighty Rock which shelters them because in the fitting words of the Hon Ernest Britto, “the Special Olympics Movement will be the best perpetual monument to Eunice Kennedy Shriver”.